Peppermint and green tea each pack a wallop in terms of health perks. Considering this tasty tea combination also has zero calories, it's worthy of prominent placement in a healthy diet. Just go easy on sugar or other sweeteners, as they can turn a sensible cup of tea into a high-calorie beverage if you use a heavy hand. Although it's not a cure for illnesses, peppermint is a decongestant and expectorant, according to the University of Maryland Medical Center, so your tea may help clear clogged sinuses and break up coughs. The hot liquid will also help soothe a sore throat, making peppermint green tea a smart choice when you have a cold or flu. Some research also suggests that drinking green tea may help prevent these infections in the first place, according to New York University Langone Medical Center, so sipping during flu season may help keep you well. Both peppermint and green tea contain antioxidants called flavonoids, which alter cell-signaling pathways to possibly help prevent disease, according to the Linus Pauling Institute. Peppermint and tea each contain different types of flavonoids that are all linked to reduced risk of heart disease, cancer and degenerative brain diseases. More clinical trials are needed to confirm these benefits, however. For an even bigger flavonoid boost, add a spritz of lemon, orange or another citrus fruit to your tea. If you suffer from indigestion, peppermint green tea may help. Peppermint calms the stomach muscles and improves bile flow, helping your body break down fats from food and speeding digestion. Peppermint can increase symptoms of gastroesophageal reflux disease, so don't use it as a remedy if your condition is GERD-related. Although peppermint green tea is typically safe, a review published in "Phytotherapy Research" in 2006 warns that peppermint oil may not be suitable if you have hiatal hernia or kidney stones. In addition, green tea contains caffeine, which may cause jitteriness, upset stomach, sleeplessness and other side effects. Although caffeine content varies by brand and steeping time, consuming more than 5 cups per day can lead to dangerous caffeine intake, possibly causing more serious reactions such as tremors, irregular heartbeat and convulsions, according to MedlinePlus. 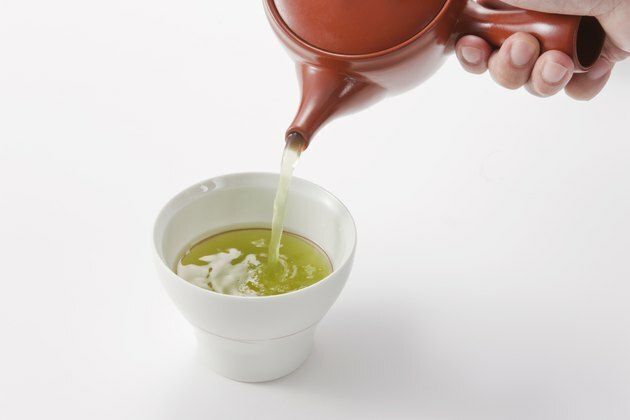 New York University Langone Medical Center: What Is Green Tea Used for Today?